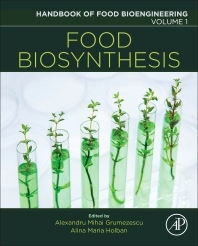 Food Biosynthesis, Volume One in the Handbook of Food Bioengineering series, describes the main aspects related to the biological production of synthetic ingredients and natural foods, highlighting the impact of bacteria and plants in the biosynthesis of key food components. Biosynthesis methods could help solve issues like food shortages, providing consumers with preferred ‘natural’ food options. This book represents how biologically synthesized ingredients, such as vanilla flavoring, soy, milk and egg substitutes can be utilized as a desired option future foods. It is ideal for scientists and researchers who want to improve their knowledge on the field of food biosynthesis.